QuerySense detected critical queries! Check for harmful statements. We hope you never see this message, but if you encounter, that means there might be a harmful query which could cause you loose data. QuerySense steps in this point and warns you right before you execute your query. 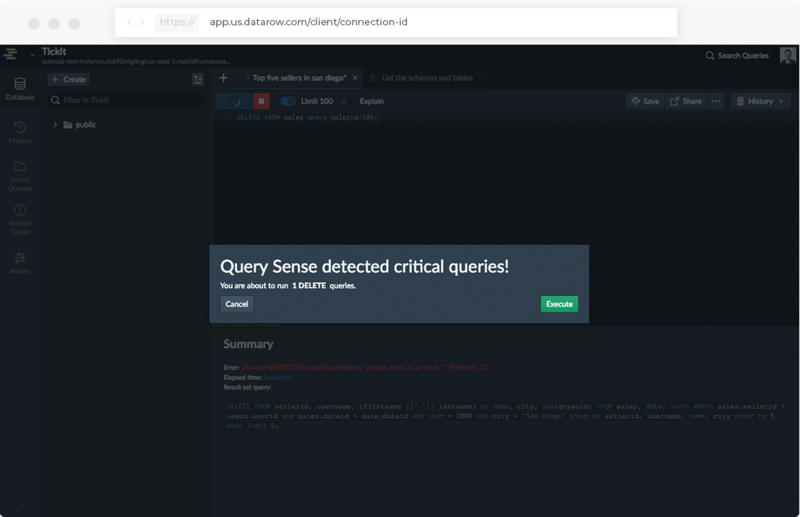 QuerySense, one of the unique features of DataRow, consistently checks your queries and detects any SQL statement that may cause a loss on your data and warns you before execution. QuerySense watches for some SQL statements such as DELETE, DROP and TRUNCATE and asks for a confirmation. QuerySense is activated by default on all production connections. However, you can extend the activation of this feature to all connections types, even for development.